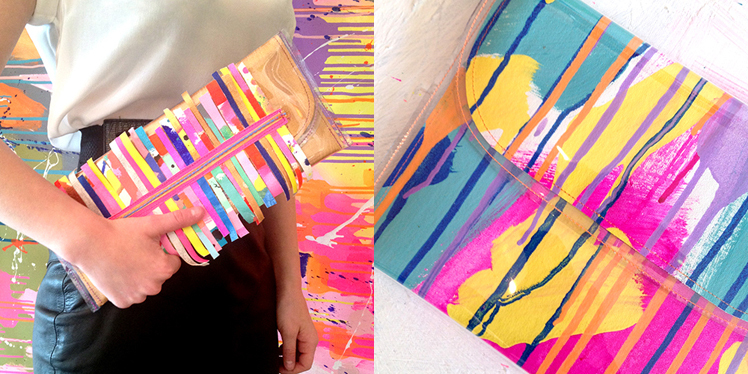 FK chats to super colourful and talented Tiff of bags and accessories label, Tiff Manuell. 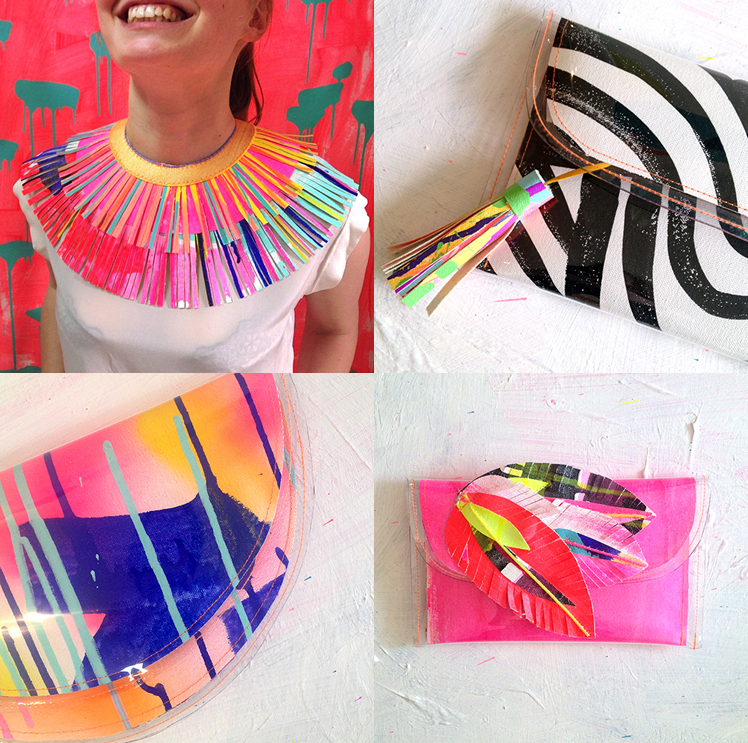 Keep your eyes peeled for her bold and bright creations in our debut section at the upcoming Sydney Markets! 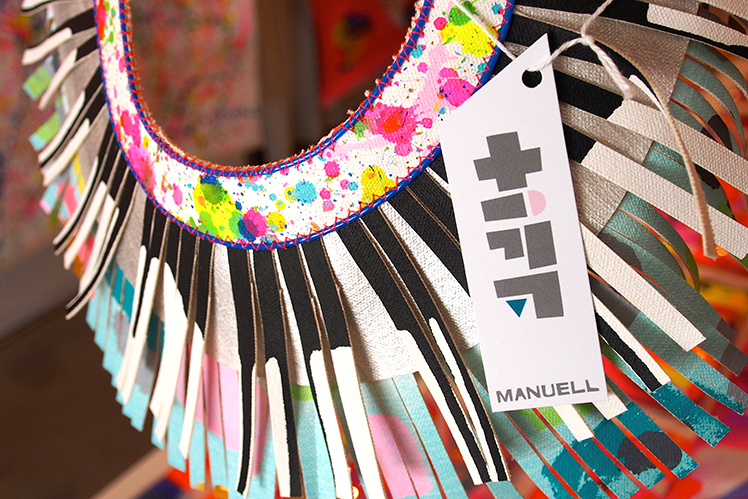 Tell us a bit about your fabulous label Tiff Manuell and what products we can expect to discover? My label really has come about after I wanted to experiment outside of the design work that I had been doing in a more commercial field. I gave myself a couple of days a week to paint and make. The range is very bespoke at this stage, I paint lengths of artists canvas only 2- 2.5m with a unique design. From that canvas I can cut up to 10-13 bags but sometimes less. The smaller areas left are used to create the jewellery or wearable pieces. The range at present is made up of shaped clutches, large tote bags, cuffs, neck pieces and soon to be released printed tights. The clutches and accessories are all hand made here in Adelaide and crafted individually so each has their own distinct finish and design. The materials are mainly canvas but PVC form the covers and I use PVC tubing, leather and polymer clay for detailing. I have been in the design industry for years, I’m not a spring chicken, rather a mother hen. I started a brand many years ago called Happy House that filled a market for young girls lifestyle products, bedroom and gift etc. This range still is sold internationally. I studied fashion design at RMIT. The Tiff range came about after really wanting to get back to immersing myself in painting and sewing and bringing art to fashion I guess. I am inspired by all cultural influences, magazines, pinterest, travel, street culture, blogs and books. More so by colour palettes though. 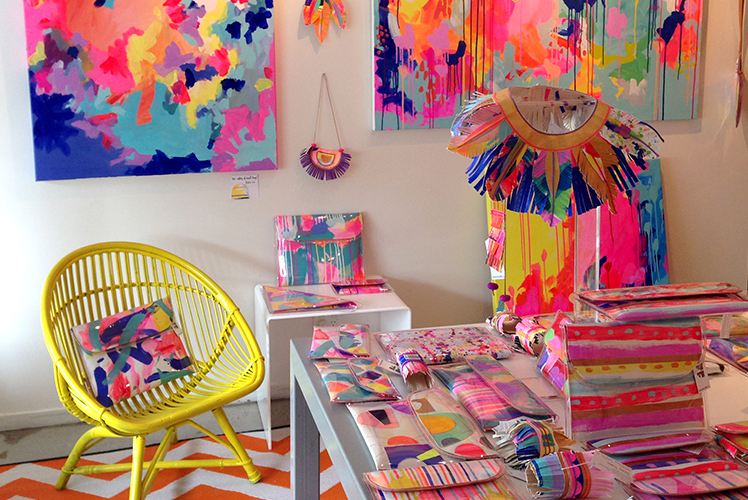 I love colour more than anything else and combinations and how it can be applied together. My studio is a great space, it’s close to most things, the city, my girls school and a 20 min drive to our house in the hills. It is modest but has lots of light, a concrete floor perfect for painting on and it is set up as a shop space also for the casual shoppers. 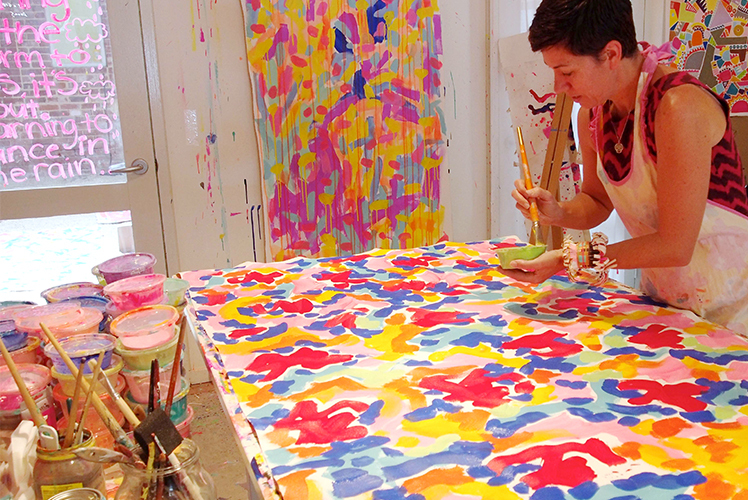 I use every space in the studio, tables walls and floors for painting the canvases on, sewing and cutting and gluing. 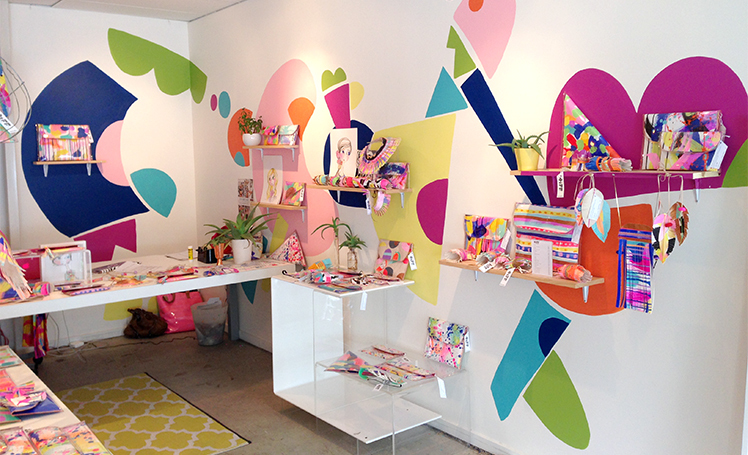 The shop space changes around occasionally but I am not much of a retailer! I basically paint, cut and make in that order and pack orders! Each bag is also individually tagged with its own number and canvas name so its all pretty labour intensive. I have a couple of contract machinists and my mum and mum in law make all the hand made Tiff tags which are sewn into every bag. What do you love about working with bags and accessories? I think for me the bags are a blank canvas with just a multitude of options to decorate. I paint, sew sections on, create detailed fringes to decorate the top of clutches and really is there are endless ideas, it is so inspiring and I try hard not to replicate ideas too much. This keeps every bag with its own unique characteristics. Never two identical. The accessories fall out of just experimenting with the off cuts of canvas, cuffs, fringed neck pieces, the hand cut /made feathers which decorate and adorn bags and neck pieces and the neck collars. I have a young design student also who works one day a week and I let her experiment with these items. The accessories are so playful and once again each end up with unique features. I feel like I can be as experimental as I like because the production is so limited and risk free. I make, if it sells I make more! 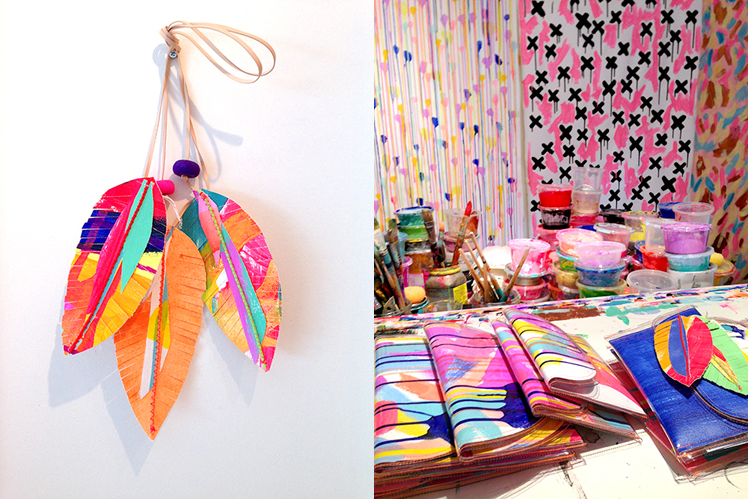 What can we expect to see from Tiff Manuell at the upcoming Sydney Markets? I will have a wide range of clutches in unique painted patterns. Accessories like cuffs and neck pieces but also I hope to bring printed tights which I am launching in 6 weeks or so. I hope to keep the patterns ever evolving and fresh with loads of personality, very abstract and colourful of course!